Trench art is a term used to describe any decorative items made by soldiers, prisoners of war and members of the public as a result of a war taking place. Pieces of trench art wouldn’t exist if armed conflicts didn’t happen. A massive amount of trench art was produced by the soldiers of World War 1 (and this explains where the term comes from), but trench art is not limited to World War 1. The first trench art comes from the Napoleonic Wars, and those involved in conflict from then until now have continued to produce works of art and decorative souvenirs. During the Crimean War canon balls were fashioned into inkwells, and during the American Civil War, powder horns, snuff boxes were personalized, and game pieces were made from bone and used bullets. Prisoners of war from the Napoleonic Wars (1796 to 1815), often locked away for years in very poor conditions, manufactured items from bone, straw and wood to trade for more food rations. Surviving examples of Napoleonic prisoner of war art include highly detailed models of ships made from bone, and decorative straw work boxes. Some of the trench art of World War 1 was created in the front line trenches themselves (for example, carvings were made in rock outcrops around dug outs), but most was made by soldiers at rest stationed away from the front line, by prisoners of war, or by soldiers recovering from their wounds. Shell art is incredibly popular among collectors of trench art. 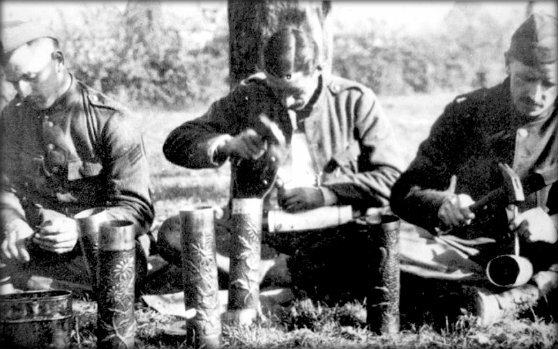 Shell casings could be decorated by embossing and engraving, and World War 1 produced a massive range of different examples. The designs often included flowers, animals, military images. Some detailed the artist’s war record and others included inscriptions to the artist’s loved ones. Other popular items of World War 1 trench art included, letter openers made from pieces of brass and cartridge cases, napkin rings, dinner gongs, picture frames, finger rings, and models of aeroplanes and tanks.